The new-high lift ParaMax Suspension System, now available on all Titan trailers offers a more comfortable ride and a longer tire and trailer life for haulers who operate on rough roads and off-road sites. The ParaMax high-lift steering axle system, designed by Titan Trailers Inc., is rated to 25,000 lbs. with steer angles at 30°. The suspension was designed to provide extreme travel and high-lift capabilities of up to 10.5” and 13.5” of the total axle travel capability for the most demanding on-road and off-road conditions. Titan Trailers is a premium manufacturer of custom-built trailers specializing in severe-duty applications such as forestry, aggregates, scrap and waste hauling. As Mike Kloepfer, President of Titan Trailers, announced the ParaMax suspension, he credited Titan’s experience for the development of the new system. “We work closely with our customers in the field and we see what they go through. Conventional steering axles with trailing arm suspensions having limited up-travel and were not capable of handling the extreme conditions of many logging roads, quarries and landfill sites. So we tasked our engineering group to find a better, more durable solution that would also reduce the cost of operation due to extended tire life and reduced tire damage.” The ParaMax suspension is designed around high-travel parallel linkage with the king pin set to 90o to the ground. 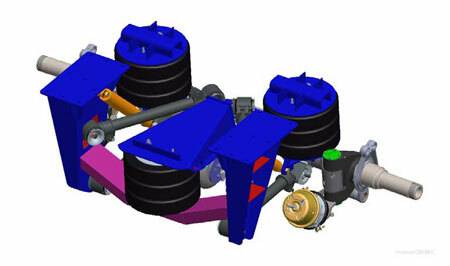 The parallel mount configuration allows the suspension to lift the axle higher than other steer axles. The additional lift means that Titan Trailers can go where other trailers will not be able to go. It also ensures that the lift plates stay parallel for increased airbag life and significantly reduced tire wear. This configuration provides the axle with more freedom to displace different heights vertically as well as from side to side. 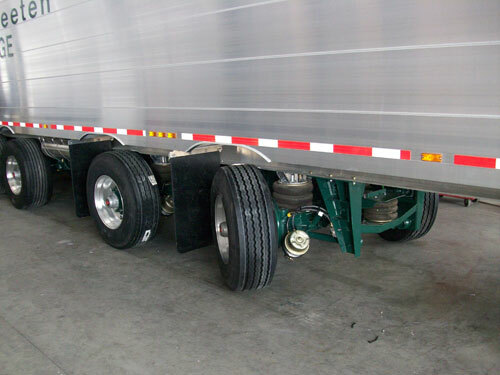 The trailers may also be fitted with super single low profile tires to allow even more clearance. Furthermore, according to Kloepfer, the tracking capability of the ParaMax Suspension System means that even in the rough conditions, the tracking of the tires is constant and complete and minimizes the potential for uneven tire wear and damage. With a greater freedom of movement, the system maintains a comfortable ride on deeply rutted roads and in rough off-road conditions. The design of the suspension allows the left side to vertically adjust to a different height than the right side, thereby relieving potential stress on the axle and the suspension as well as on the trailer itself. With its higher ground clearance in the lifted position, the ParaMax suspension reduces stresses and impacts on the axle, as well as minimizing wear on its tires. By avoiding damage to the system, the trailer will consistently track better in the long run, provide a better ride resulting in decreased driver fatigue, increased trailer availability and longer life for the entire body structure and running gear. Single-axle ParaMax Suspensions are now available on its full line of live-floor trailers.